Radegest is a lightweight client for OpenSim and Second Life available for Windows, Linux and Mac. 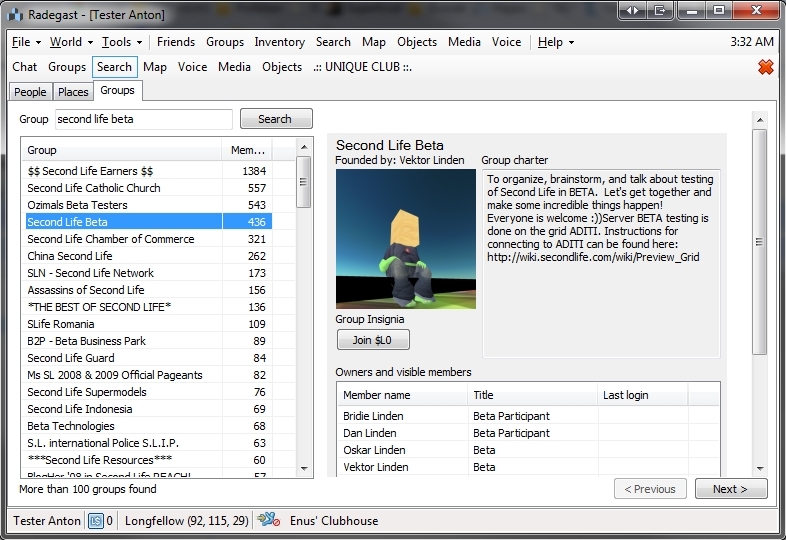 As well as providing text-based capabilities, it was the first lightweight Second Life client to offer a 3D world view (windows and Linux), allowing users on low-end systems to have a visual experience when using a virtual world. Offering a similar level of capabilities and interaction as a full viewer, and supporting recent updates and improvements to the SL service (mesh rendering, HTTP protocol updates, Marketplace Direct Delivery, Server-side Appearance, etc. ), Radegast has become very popular among users with visual impairments and with audio gamers. So much so that Roxie Marten and Celene Highwater of Virtual Ability Inc., have written a comprehensive Accessibility Guide to help people get started with Second life through Radegast. This not only serves as an excellent introduction for the visually and aurally impaired, but forms a thorough introduction for anyone wishing to gain familiarity with using Radegest. Because of Radegast’s popularity among the visually impaired, Celene Highwater will be teaching a special class on Radegast for all those interested in assisting new users understand the client and in helping them become a part of the growing community of blind SL users. The class will be held at the The Tavern on Wolpertinger, on Thursday May 29th, at 12:00 noon SLT / PDT, and will take place in text, or voice upon request. Anyone who is interested in learning the ins and outs of Radegast in order to help blind or visually impaired users make effective use of the client, is extended a warm invitation to attend the session.